With the 91389 Qube® Mini transport patient monitor, there’s no compromising your access to high acuity patient data at the bedside and on the go. Optimized for transport, the Qube Mini ensures an uninterrupted level of vigilance when the patient is most vulnerable. 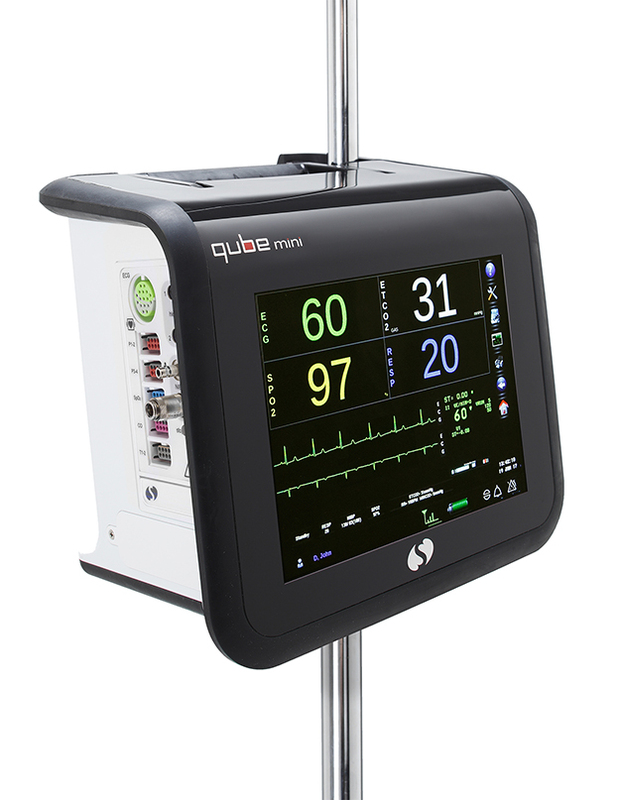 Qube Mini’s large screen size makes patient data readable from the bedside or across the room. When deployed with the Spacelabs Xhibit Central Station and Intesys Clinical Suite, Qube Mini offers enterprise connectivity to your hospital EMR, ECG management systems, paging systems, and remote access solutions. Caregivers see the same data, presented in the same screens as Spacelabs wall-mounted patient monitors. Caregivers benefit from a familiar, intuitive user interface. Capacity for 11 parameters. For more details on the Spacelabs Clinical Parameters, refer to the Clinical Parameters page. All waveforms and values are sent to Xhibit central station, XprezzNet, and Clinical Access, whether operating on battery or power supply. Comprehensive patient data transfer on or off the network. Mini patient monitor is lightweight and rugged to withstand accidental drops, meeting the needs of busy transport and mid-acuity environments. The patent-pending integrated intravenous (IV) pole mount and 8-inch touchscreen display with alarm light delivers vital information where you need it to be, at the bedside or on the go. With wireless networking and an integrated battery, Qube Mini supports transport up to five hours. One caregiver can transport, view monitor, and face the patient simultaneously. Integrated clamp allows instant mounting on virtually any IV pole or bedside rail without special brackets. Rugged design with neoprene bumpers to easily handle a 1-meter fall. Integrated clamp eliminates the need to set the monitor in the patient’s bed where cross-contamination can occur. Mounts easily on IV pole or bed rail for optimal caregiver visibility and patient comfort. 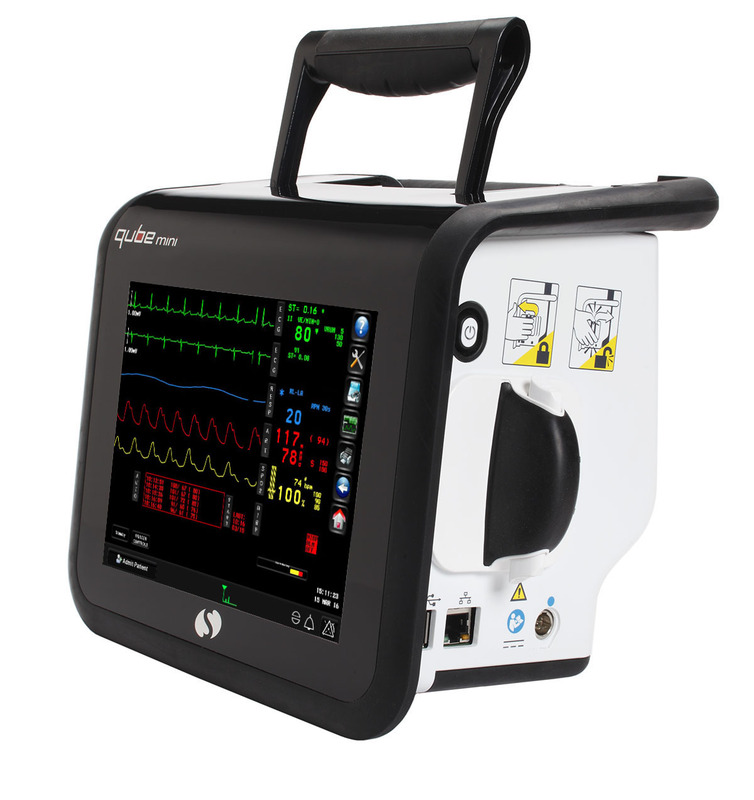 Qube Mini wins in parameter capacity, battery life, connectivity, trends, ease of viewing critical data, and comprehensive patient data transfer.